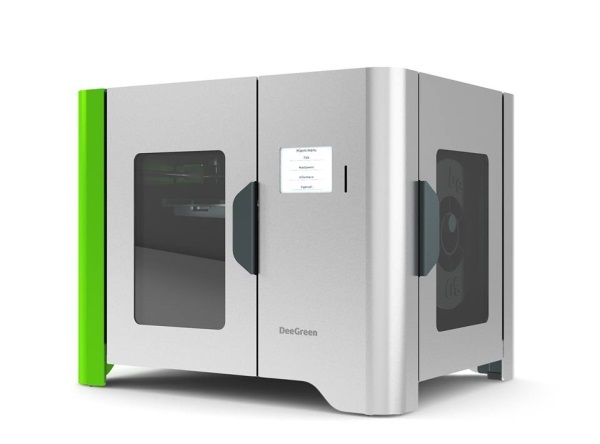 The be3D DeeGreen is a 3D printer that has a quick setup process, which allows it to be used soon after unpacking, and is suitable for 3D-printing beginners. It comes with robust software that is capable of achieving a range of tasks, while remaining user-friendly. There is a 0.75kg filament included as part of the package to aid the process of immediately starting printing, though it is more expensive than other 3D printers with the same specifications that are capable of achieving the same results. The be3D DeeGreen is a single extruder printer that has been designed for convenience by omitting any unnecessary accessories. The frame has dimensions of 495 x 395 x 390mm and is capable of printing items that measure 150 x 150 x 150mm. The clean lines of the frame make it easy to operate, with the touchscreen being clear and providing a six-line resolution. The printer has a single extruder and can be used with various filaments, including PLA, ABS and a wood-based filament from be3D DeeGreen. The be3D DeeGreen 3D printer comprises a glass print plate that can be removed to make it easy to clean. The device benefits from automatic calibration via an in-built sensor that measures the distance between the nozzle and the plate – this saves time in preparing the 3D printer for a task. The be3D DeeGreen has a 0.4mm nozzle and can achieve layers of various thicknesses. The device can accept input via an SD card and USB. The be3D DeeGreen can only be used with an SD card, but there is one included. This 3D printer does not have wireless connectivity, and its price point is fairly high relative to its operational capacity.